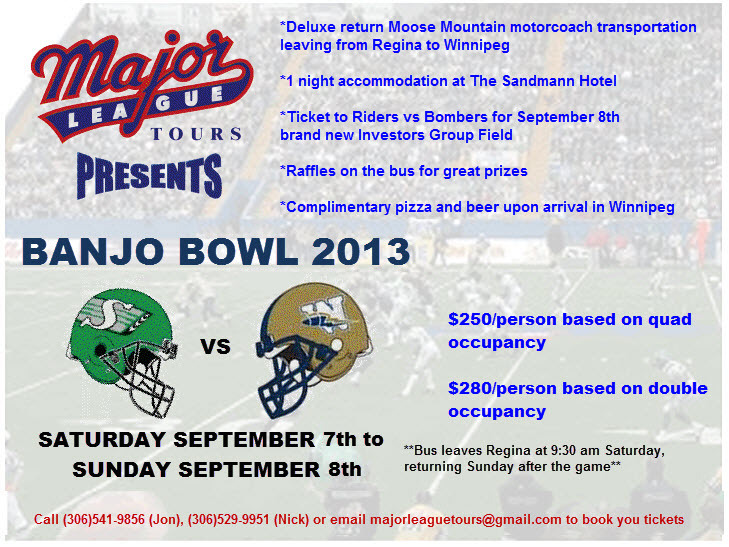 Our friends at Major League Tours are back with their annual trip to the Banjo Bowl. Its a great deal and the trip is always a blast. See the poster below for full details and be sure to get in touch with them for more info or to book. Pfft only 30 offensive points with the back-up QB? And here I thought we had a good offense? Since the concept of sarcasm is lost on so many people and at times difficult to convey over the interwebs, I would like to state clearly that my opening statement was sarcasm. Because honestly outside of that I’m hard pressed to come up with something to complain about this team. We are undefeated, our offense had its worst performance of the season and still put up 30 points… with the back-up QB, the defense decimated the opposition for 7 sacks and 2 fumbles and held the opponents to just 3 second half points… despite missing 3 starters in the secondary. When you look across the board at our roster, you have to be happy with pretty much everything you see… except maybe Dan Clark who obviously got lazy after his TD and quit pulling his weight on offense. Drew Willy looked like a completely different QB than I saw last year. Where last season he had happy feet and looked to run a lot when the first read wasn’t there, Saturday we saw him poised in the pocket, making his reads and throwing like he was a seasoned vet. Sure he made some bad throws and some bad reads but all things considered I was very impressed. What I really liked was the fact that we didn’t change our offense just because Durant was out. The Ti-Cats (as I said) focused on the run so we continued slinging the ball downfield. Willy got a lot of help from Geroy Simon who picked one hell of a time to make his first real impact on this team. As vocal as I have been about Simon not being worth what we are paying him, for one game at least, he proved he can still be of value. Defense got blindsided initially by the Ti-Cats being not just useful but very effective on O… hard to blame them as who really saw that coming? But it seemed once our offense started showing signs of life the defense kicked it into high gear and helped Henry do what he does best (at least on the field)… turn the ball over multiple times. D-line brought pressure to help compensate for a secondary that looked like it was missing some starters. For the Ti-Cats the defining series was the blatant drop by Onrea Jones that he let the team challenge (and they somehow imagined conclusive evidence of a catch) which was followed by them being forced to burn a time out before the next play due to confusion on the field. Good teams rise to up the challenges they face and bad teams create their own challenges. So the Riders head into a very oddly timed bye week with a perfect record and a blossoming reputation for finding new ways to win on both sides of the ball each week. What offensive weapon do you game plan against? We have 5 receivers who have put up 100 yard games already. We have scored a TD with pretty much every offensive player not on IR. Our defense is relentless and suffocating, particularly in the 2nd half… and that is without 3 starting DBs. And our special teams have been outstanding. We are excelling in all 3 phases. As much as this Rider-less bye week will be excruciatingly painful to us fans, it will be a good chance for the team to get healthy and ready to continue our dominating start to the season. - I never thought I’d run out of things to say about an RB going over 130 yards in a game. Sheets has pretty much made that ordinary. - Helps when our very well paid OL starts playing like they are worth every penny. - I know personnel play into it but you gotta think our improved play in the trenches is due in part to our new OL and DL coaches. Last year our all-star laden OL underperformed too often under Coach Sweet and I’d was never sold on Mike Walker being any good. - Would not surprise me to see Steinhauer fined over his hit on Lamar. - Russ showed why he was the odd DB out in training camp. Rough day for him. That said for an emergency fill in off the streets he was at least serviceable. - Speaking of showing why, Hilee Taylor showed why he worked his way onto the roster while Will Davis wound up unemployed. - Reminder that if you want to show your support for our hero of a back-up QB, the I Heart Willy T-Shirt is still available in the Rider Prophet store. Saturday the Riders head to Guelph (aka the home of the football field with the giant checker board in the endzones) looking to complete a dominating sweep of the hapless Ti-Cats. You could probably just go back and read my pre-game post for last week’s game as it’s all pretty much the same. But I suppose since you are here anyway I could at least make an effort to come up with some new material. I can’t promise it will be good but by know I’m sure you are well accustomed to my levels of quality. Even though we are playing the same team again, there are numerous changes going on with both teams that will likely make for a completely different game come Saturday. On the Ti-Cats side, Andy Fantuz will likely sit out yet again (thus making our investment in Geroy Simon look like a shrewd investment by comparison). However, the Cats should get a couple offensive weapons back in the form of Dave Stala, Onrea Jones and running back CJ Gable. That can only improve their offense… mainly because short of forgetting their pants, they really can’t do worse. Defensively it’s a different story as they have cut Markeith Knowlton and brought in Brandon Isaac. Not sure if Isaac will play but if he doesn’t I don’t like the Ti-Cats chances of improving their abysmal run D by continually shuffling rookie LBs in and out and playing vets out of their normal position. The basic philosophy seems to be that if they throw enough crap at the wall, something is bound to stick. That’s a bold strategy Cotton. For the Riders, some bad news as it looks like McHenry will be out a few weeks. Sounds like rookie Spencer Moore will take his place. I think his size and athleticism will be an advantage in the passing game but I worry about his lack of experience blocking at the pro level. In the secondary, at least one (maybe both) of Harris and Maze should check back in, which can only improve an already top notch pass defense. The big news is of course (yet again) Durant’s foot. He’s back in a walking boot. Here’s how I see it, I’m willing to bet Durant could once again tough it out and play outstanding. He’s a warrior and has a long history of doing that. But unlike last week, we only have a couple days between games and the bye week is up next (for reasons I still can’t fathom). So while I’m pretty sure he COULD play, I’m not sure that he SHOULD. We are 4-0 and playing a bad eastern opponent. The way our D and run game are performing, even a mediocre performance by Willy should get us the win (and if anyone knows a thing or two about mediocre Willy performances… ahh never mind). Absolute worst case scenario we are 4-1 going into the bye. I would rather that and a healthy Durant over the remaining 13 games, than see Durant grind himself down and end up so physically beat up by the end that he can’t play his game when it matters most (see Grey Cup 2010). Season is a marathon not a sprint. 1 – Hamilton has 2 takeaways this season… we had 2 takeaways in the first half last game. 3 – They have scored 7 TDs this season… we scored 4 TDs in the last 3 quarters of football. 5 – Their entire team has combined for 261 rush yards this season… Sheets did that by himself in just 2 games. Hamilton will play better offensively and will likely score points… I mean honestly you’d have to try really hard not to score at least a single in 8 quarters of Canadian football. With Gable back in they will try to establish the run. Defensive game plan needs to be the same: strong play up front to eliminate the run and make life miserable for Burris in the pocket and eliminate the big plays downfield. Hamilton simply doesn’t have the playmakers to continually put together long drives against us. As for the offense, if I’m Hamilton and Willy plays, I bring the same defensive game plan as last week. Stack the box, eliminate the run and force us the throw. Durant embarrassed them when they tried this but odds of Willy making some of the deep throws that Durant was reeling off are a lot less. That means that we will a) needs to be patient with the run game (something I’m not at all worried about) and b) focus on short and intermediate passing routes. If the LBs are cheating up to stop Sheets then Smith on the crosser or Dressler/Simon hooks just behind where they vacate will be deadly and are high percentage passes for Willy. I would also use Willy’s mobility to our advantage and roll him out and take off the odd time (yes I’m calling for the Willy naked bootleg to be used). The way our offense gets spread around, Getzlaf is probably about due for a big game. Also, we can’t be afraid to let Willy take shots downfield if they are there. The Ti-cat secondary isn’t all that good at this point. I fully expect the Ti-cats to make a game of it this time. They have a few more weapons on O and will be at home (kind of). That said I still don’t think the Ti-cats are in the same league as us. It will be close but we will win. Inspired by the now legendary NFL QBs on Facebook posts done by www.ProFootballMock.com here is the latest Candian version. I’m well aware that it’s not morning but given my track record did you really expect a morning post after a Sunday evening game? I sometimes struggle when it’s a Friday evening game. In a league that awards a point for missing a FG and punting too far, the Ti-Cats somehow managed to put up a goose egg on Sunday night. I know lots of people will downplay this pummeling by saying that it was against a weak opponent but so what? That’s what’s supposed to happen when really good teams play bad teams. We are a really good team. Hamilton is a bad team with a bad defense, no run game and missing pretty much anything resembling a top flight receiver. We were supposed to beat them and we did… quite handily… the system works. Before I get to the game… by far the highlight of the game was Andre Proulx. In his finest moment he screwed up the penalty call (mixing up offense and defense), paused to shake his head and collect his thoughts… and then top it off by pointing the wrong way while trying to correct himself. Worth the price of admission right there. Bonus points for calling a benalty on number turty tree (even though the actual penalty was on 24). By now you may be sick of borderline crush on George Cortez but you’ll just have to deal with it. I love him and I love our offense! It is firing on all cylinders. Durant seems so comfortable and in tune with it and it is designed to remorselessly pick on any weakness the opposing team is show us. It was clear that Hamilton was dead set on stuffing Sheets so what do we do? Start heaving it up to Rob Bagg (who is back as an impact player) and Dressler, and keep doing it until the defense backs off enough to let Sheets do his thing. We also made really good use of that McHenry leak out. For once our offense is dictating the play to the defense rather than the other way around. I really noticed this game just how in tune Durant and the receivers are with the timing and execution of this offense. One play in particular I saw Durant throw a short pass to what looked like an empty space only to have Bagg swoop in at the perfect time and make the reception. If they keep playing like this we will be formidable to even the best defense… and as Sunday proved, deadly to the one who are defenses in name only. Of course no talk of the offense would be complete without mentioning the Dan Clark TD. For the record, last Monday I wrote the following in my sentimonies… “At this rate I’m convinced that our Banjo Bowl offense will revolve primarily around Dan Clark somehow. . The only appropriate thing to say in a situation like a Clark TD is what John Madden said in the Replacements “I love to see a fat guy score, Because first you get a fat guy spike, then you get the fat guy dance”. Memo to Clark: if you plan on scoring again, work on the spike and dance. Defensively I think it would have been a slightly different story if Hamilton had had Fantuz in… but not much. Defense came to play. Its hard to imagine them doing much better than they did on Sunday but I’m trying to imagine what would have happened if Harris, Maze and Thomas (i.e. the majority of our starting secondary) had played. Ti-Cats may have found a way to get negative points. When the defense held them without a point with the wind I just knew the Ti-Cats would not be scoring about as much as a math major in college. We brought big time pressure (5 sacks) and limited the big plays. I'm pretty sure we would have help them in check even if we allowed them to field 2 extra offensive players. Another solid effort in all 3 phases in what is becoming a pleasant trend. Not used to being in the position of being the team to beat but I could certainly get used to this… and the way we are playing, likely will. - When was the last time that 130 yard performance by an RB seemed like no big deal? - Not sure if you noticed but when Sanders subbed in for Sheets at the very end of the game, after only 1 play (a first down), Sheets tried to sub himself back in by walking onto the field only to have the coaches quickly direct him back to the sidelines. - I see Geroy Simon has taken over the “Mandatory Standing Ovation No Matter How Insignificant The Play Was” role… should have at least saved the cheers for his second reception that was actually worth cheering. - I was hoping that one Bartel punt would float backwards through the endzone… I wonder what the rule is on that?